Sleet, snow, ice and freezing temperatures last week were all good reasons to stay inside and close to one of the woodstoves. When the weather forecast called for our first real winter storm of the season, I decided it was time to make my annual supply of bone broth. Dig through the freezers for the the various bags of bones I popped in over the year. These are set in bowls in the chilly pantry to defrost. Treks outside to fill hay feeders and top off water buckets with hot water are frequent, but having that good wood heat to come back to is a comfort. Begin soaking defrosted bones in mild vinegar water (1 tablespoon apple cider vinegar per half gallon of water) to dissolve the minerals. The long soak followed by two days of simmering extracts calcium, collagen, magnesium, phosphorus, silicon, sulphur, chondroitin sulphates, and glucosamine from the bones. This is the first year I've had chicken feet to add to my broth. These are rich in glucosamine chondroitin, collagen and other trace minerals. Shards of ice break free from tree branches and sprinkle down everywhere. In one of my frequent critter checks I find Surprise shivering from the cold and have to do something. First make-do goat coat was a towel secured with grosgrain ribbons. That didn't last. Second coat was made from an old sweat shirt worked better. Surprise in her goat coat. The composting action of the manure and straw produces heat. Overnight, ice in all other buckets was too thick to break by morning, but this bucket was just starting to form ice on the water surface. Strain broth, set in fridge to cool. Warmer temperatures are predicted over the weekend and the ice has slowly been melting. Actual damage from the ice and wind hasn't been too bad, with only nominal damage to the fence. It was fortunate only the top of the tree landed on the fence. Skim the chicken fat from the stock but there isn't much. A good bone broth will be congealed when it's chilled. Looks to be a good batch. I'll add salt to each jar I can. Bring the broth to a boil for canning. Get the canner, clean jars, and lids ready. While everything is heating, pick the meat from the cooled bones. Can the broth. I like pints the best because it's just the two of us. I use them for soups, stews, gravies, and cooking grains or beans. Open a quart of home canned chicken and make a homestead chicken pie for dinner, adding the meat bits. If there had been enough chicken fat, I would have used it to make the biscuits, but there wasn't. A few mild days and nights bring some relief, but they're calling for snow tonight and tomorrow. I hope all of you are staying safe and warm. There's nothing better than making bone broth on those cold days and putting a stash up in your pantry. I've never added apple cider vinegar to my bones when making broth. I do however let the broth simmer on the stove for over 24 hours with onions, celery, carrots, and bones. This evening, I pulled out two quarts of my chicken broth, and made some homemade chicken soup with Mexican rice to help warm us up. Ok, it gets a LOT colder where you are than where we are. I have NEVER seen weather like that here in Ballan! Bone broth is the ants pants and bees knees all rolled into one. I have a freezer full of broths (or stock as we call it here) that I need to can. Rabbit stock and chicken stock. My pantry is down to 5 x 600ml jars of stock; 1 fish, 3 lamb or beef (I forget which) and 1 chicken stock jar now. Time for some serious chook stock making for sure. It will have to wait for winter though. I'm not leaving the electric hob on for 2-4 days in summer (which will be close to free with solar panels but the house would heat up like fury despite today being a mite chilly). Hope the storm breaks soon for you and breaks nothing but itself in the process. Sandy, I'm down to only one quart jar from last year's batch so it was definitely time to make more! I ought to try the veggies in my broth because they would surely add flavor and more nutrition. Some folks roast the bones first, which is supposed to enhance flavor. The vinegar pulls the minerals out of the bones but it's not enough to notice in the end product. PP, I feel fortunate we have as many mild breaks as we do during winter. If below freezing was sustained, we'd be investing in some sort of water heating system for the barn too! 3 Roosters & a Chick, welcome! It's funny, but both Dan and I grew up in the north (NJ and IL) and used to want to move back there. Not sure I could do the northern winters anymore! I remember our years in Arkansas with those types of winter storms. Stay warm and safe!!! I can't wait to make bone broth one day. Leigh I just made some using lots of the bones from our cow and will be posting about it soon. Since it is summer here it is not being consumed at the moment but I am looking forward to having it on hand this winter. Since we have had a very cold winter here, I empty my ice twice a day. The easiest way is to invert the bucket where ever you want the ice and pour a little warm water over the sides. I stomp on the top of the bucket and the whole chunk falls out. Even in the negative numbers, we will usually have a water core to our ice chunks. Suola (being Finnish) knows to come right up and drink from her ice cup. My weather, being colder, necessitates a LOT more straw and manure up the side of the bucket. It is my only method in my non-electric barn. We are ice free at 20˙F. It is, however, inside the shed with a deep litter straw bed and a South facing open doorway. Passive solar and biological action. Read that: FREE. Is is hard to use chicken feet? I have always been put off by the unknown. I know that there is meat in there, I have just never seen anyone use them in person. Tuesday, yes, similar to Arkansas. Ice is worse than snow! Fiona, I will definitely look forward to that! I know how tough it is on you down south. My brother lives in Alabama and fills me full of stories on the chaos that ensues with cold weather, snow and ice. Back when we were raising livestock, we buried giant earth tubes (corregated plastic tubes a couple feet in diameter) about five feet deep in the ground and ran watering lines up through the center of it. We would put pipe insulation on those pipes. It was a one time cost unlike electric heaters and kept the waterers ice free down into the teens most days. Still probably not financially feasible for you unless you got some leftover tubes free somewhere. I think having a good supply of bone broths in the pantry is an absolutely necessity of my cooking anymore. Because I make and we eat so many soups year 'round, I go through a lot of it. I've been making beef bone broth for a friend who has Stage IV cancer and it's one of the very few foods she can tolerate. I do always put veggies from the garden (root cellar this time of year) in the broth while simmering it (and then fish them out, of course), but hold off on the salt until I use the broth. Ooops! " . . . absolute necessity . . . " Sorry. Absolutely. Your pot of chicken feet looks really scary, like something in a scene from Macbeth. But I'm sure the broth is really delicious. Stay warm. Bone broth is fantastic! As a matter of fact, I'd love to be sipping on some right now! Hey I saw in the comments that you said one of you grew up in IL. That's where we are from! And we too have thought about moving back up that way, but land is too expensive and I too am getting spoiled by the milder winters! Never know where God will send us though! The bone broth looks great! That's something we haven't done yet. We do have bones in the freezer, so the opportunity is there. That sounds like a lovely way to spend a frigid week. Hope your Spring comes soon. My daughter makes bone broth every week for my grandson's tube feedings. She adds grains, greens, a protein and blends for the most nutritious meal anyone can have. He has done so much better by using whole foods than the canned "milk" stuff. It takes her a lot of time and energy but his health has paid off. He is walking and starting to talk and he is now 4! Ed, the south is so poorly equipped for cold, ice, and snow. From the way it's managed to the clothing they sell to go out into it. My real winter wear all comes from the north! Mama Pea, bone broth would be a wonderfully nutritious food for someone struggling with cancer. I may have to try adding veggies with the next batch. Mostly I don't for simplicities sake. I'd like to try roasting the bones next time too. Alice! Good to hear from you. I have to agree about those chicken feet, although I'd use the word, "gross", lol. Still, no sense wasting them (and the pigs ate the bits that were left). Goodwife, I'm the one who grew up in Illinois. I've been in the south for so long, though, that I'm no longer acclimatized I'm afraid. I love where I live and even though homeborn Southerners will never consider me as such, I am one nonetheless. Mark, can't deny I'm looking forward to spring! Our high today is only 32 after an inch of snow early this morning. But they're predicting the 40s by the end of the week so there's hope! Mom at home, adding grains and greens sounds like a wonderful idea. So glad to hear it's been a help! Real food always trumps artificial nourishment for results. This morning while getting my coffee ready, I pulled out the chicken bones, vegetable peelings, some shredded zucchini, tossed in two onions, 4 celery ribs, and 5 carrots, with garlic salt (I can't keep real garlic as it goes bad before we use it), and seasonings. After reading your post, I added a splash of apple cider vinegar. Now I'll let that simmer all day and then decide if I'm making soup this evening or tomorrow. Gotta see how set the family is to go to church for pizza this evening. Hope Surprise was able to keep her coat on and stop shivering. Love making bone broth once it cools down here In sub tropical Australia. Too hot right now. 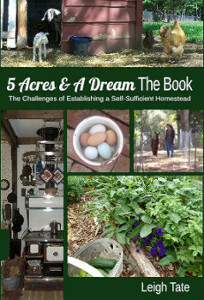 Just wondering if your book,"5 Acres and dream", is available as an e book? Leigh, I feel sorry that your goats are so chilly. We have had amazing snowfall quantities this year paired with really, really cold temperatures and every time I look outside I think of the nearby farmers, especially those with dairy cows or goats, and admire their commitment. I have to say that I'm a tad envious of that cookstove. I wonder if I can ever convince my husband that a wood cookstove would be a great addition to our living room?! I've been waiting for goat posts and can't wait till your kidding season starts as although I've been considering NDs (depending on whether I can convince council to change our animal control bylaws), I have a friend with Nubians and pygmies who has a couple of kinders in utero at the moment and having read about yours, it really piqued my interest. Jane, I don't think the many photos, maps, and diagrams make 5 Acres The Book a good candidate for ebook, except perhaps pdf, or, I'm told, one of the new, fancy Kindles. The paperback is available in Australia at TheNile.com.au, but of course the "free shipping" is rolled into the selling price! Rosalyn, the Nubians, especially don't like the cold but my Kinders all take it in stride. Of course, they all have nice down coats! Has anyone approached your government council with small goats as pets? Many of them actually are! Kinders can be pretty small as well. The breed standard allows for as short as 20" (and up to 26") at the withers. NDs are allowed a maximum height of 22.5 inches, so size-wise, Kinders can be comparable to a mini breed. Plus, they generally have larger udders meaning they are easier to milk (which is why I got out of NDs). That also means they give more milk! I'm relieved you survived the storms so well, and I am glad your goats are ok. I worried about them. I NEVER bring my dogs inside, but I did during this last long series of storms when it got down in the low teens. Even their straw house wasn't good enough in those circumstances. All that broth would be good to have. I like broth with rice, or sometimes just with french bread. I buy it in cans but I am sure yours is better tasting and better for you. Water was a real pill here for me, as well. I carry out kettles of boiling water for the chickens several times a day. I feel for you on the fence. I had an electric fence around the perimeter of my meadow and main buildings for years. But bears tore it down, hogs ran through it, and every time there was a storm trees fell on it. Finally I just gave up. Again, glad you and yours, and your homestead, made it through ok. I just made duck bone broth. It's perfect for cold wintry days like we've been having. Leigh, that's exactly what I'm hoping to do as I was more or less told by planning officials that spot rezoning from residential to rural residential wouldn't be granted, even though we meet the minimum lot size requirements. 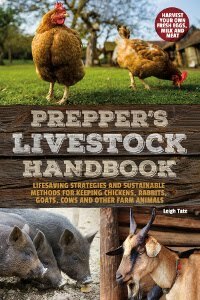 As a first step I just delivered letters to my two adjacent neighbouring houses yesterday briefly outlining our hopes and an info sheet for each hens and small dairy goats. I intentionally reworded the documents to say "miniature goats" so that in the event we are successful, I won't be completely bound to only NDs. The animal control bylaw only mentions dogs, not even cats--so it isn't really applicable to any other pets anyway, and if we rework it, I'm hoping we could get hens and goats in. I've been praying that it will go well. What size was the "goat coat" sweatshirt? Harry, I can't tell you how much I appreciate that. I'm glad you've done well on your place too. Hopefully spring is on its way! Rosalyn, I'm tardy following up on these comments and am curious as to how your neighbors responded. Caroline, it was a large, although I had to cut off the cuffs and add the band around the back. It gave me 3 baby kid coats.